Get Rid of "Communication Debt"
Get out of what I call "communication debt." If you owe someone a return phone call or email, set aside time (every day if you have to) to get ride of those debts. Even if your reply email is to say "It's going to take a little extra time for me to get back to you. I'm unusually busy right now..." then do that. And be sure to connect when things slow down (in other others, mean what you say). There's not much value in having people you care about think that you're ignoring them. And as a business person, you don't want colleagues and/or clients thinking that you can't manage your time. I learned the hard way. It's a horrible reputation to have. I've since learned to pace myself, touch base (even if only for a moment), and temper people's expectations. The less I owe, the lighter I feel. Works for me just fine! Here's to releasing that heavy load of your back. Make that call or reply to that email today. Why I Don't Use The Term "Brand"
Words are not simple. Maya Angelou said they are things. They are absorbed by people, they fill up rooms, they settle on furniture. Maybe. Like dust. Further, I believe that words carry spirits and intentions. They are magic in that they have the ability to transform, be it for creative or destructive purposes. So as the daughter of ancestors who were enslaved Africans and as one who is a public relations and marketing professional, I take exception to the word “brand,” the industry term that is so commonly used to articulate one’s identity in the market place. Yesterday, I was at the New School in New York City where I spoke at a conference entitled “Re-Mixed and Re-Mastered: Defining and Distributing the Black Image in the Era of Globalization.” I was a panelist at the Developing Your Brand and Audience Using Social Media discussion. It was targeted for media makers, mostly those who make films. The discussion was robust and I think invigorating for all of us. At one point, however, I expressed my long-standing objection to the marketing terms “brand” and “branding.” I actually loathe the words and don’t use them at my agency. I get that they are popular industry terms. Don’t care. And I understand the possible dismissive reactions to my stance. Still don’t care. (I also don't refer to my ancestors as "slaves." Rather, I acknowledge what happened to them: They were enslaved Africans. (At the panel, no one seemed to disagree with my explanation, by the way.) 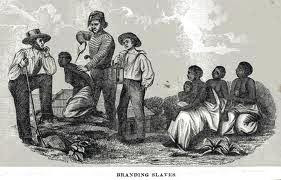 During the American era of enslavement, Black people in this country were sold as chattel and marked, with branding rods, for identification and ownership purposes. So when I hear “brand,” my mind conjures up images of sizzling, burned flesh. I hear people wailing. I hear screams like sirens, piercing. I don’t want to yet I can’t help but see images of a great, great, great aunt perhaps, restrained and anchored by rusty chains. The “slave trader” is holding a fired-up branding rod. Maybe it has the letter “W” on it. My aunt is scrambling for her life - madly, desperately trying to dodge the scorching iron that is aimed at her left shoulder blade. She can’t escape and must submit. Her family is nearby watching her body jolt and wither. Her eyes roll back and she passes out. Her husband, her daughters, and her siblings are nearby watching, horrified. They would give their lives to have her released but they have no power that will save her in that moment. Barely able to breathe themselves, they smell her seared flesh. They also taste their own vomit. They are next. I am tethered to my history and my ancestors are ever-present. Their presence is not rhetorical. I recall them as real live people who had skin and bones. I think about their feelings, their ideas, and their aspirations. I think about what they cooked, what smells lingered in their homes. I hear girls laughing, I see hands playing in the earth's soil...all of it. When I gaze at the moon on pensive nights, I wonder about what they thought when they did the same. They constantly call me by name. Always in my left ear. I honor them by not taking their lives, nor what was done to them, lightly. As a business owner of African ancestry whose work requires that I shape and transmit messages, I opt not to use the word “brand” in my conversations about marketing. Of all the freedoms that I have today, surely I can disregard industry norms that don’t suit me. Navigating the marketplace in today’s business world need not be analogous to inhumane behavior. The notion or process of identifying and promoting one’s mark (marketing) is, in essence, about finding one’s own signature. At AKILA WORKSONGS, we simply use "signature" or "identity" to replace the word "brand." I do understand that it’s common for people to use words, but not know their depth or historical context. I get it but I’ve never been that casual. It’s doubtful that my feminine energy, search-for-the-deeper meaning Gemini self will ever have such a superficial relationship to anything, especially words. I’m grateful that I am free to define my own terms. 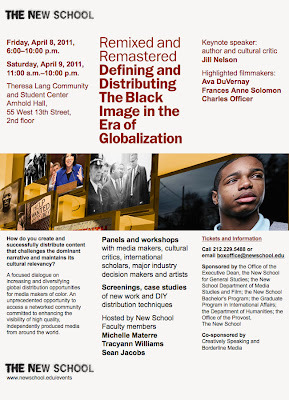 I'm Speaking Here > "Remixed and Remastered: Defining and Distributing the Black Image in the Era of Globalization"
This Saturday (April 9, 2011), I will be speaking at the Remixed and Remastered: Defining and Distributing The Black Image in the Era of Globalization conference at the New School in New York City. The panel I'm on is entitled “Developing Brand Identity and Audience with Social Media.” It's from 2:30-4pm. A glance at just some of the other participants will reveal author and cultural critic Jill Nelson (keynote speaker); film critic Tambay Obenson; filmmakers Ava DuVernay ("I Will Follow") and Charles Officer; scholars Pearl Bowser, Fabio Parasecoli; and industry notables such as HBO’s Greg Rhem and National Black Programming Consortium’s Leslie Fields Cruz. The conference will include panels and workshops aimed to provide guidance on topics ranging from creating targeted outreach to audience engagement and distribution strategies, and much more. 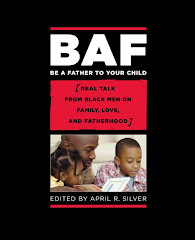 The official word is that "the purpose of this conference is to forge and solidify relationships that will expand the scope and balance of black experiences portrayed in the media, create a platform for scholars and critics to engage each other, and for media-makers and industry professionals to further analyze ways to improve contemporary media representation and the global black image." 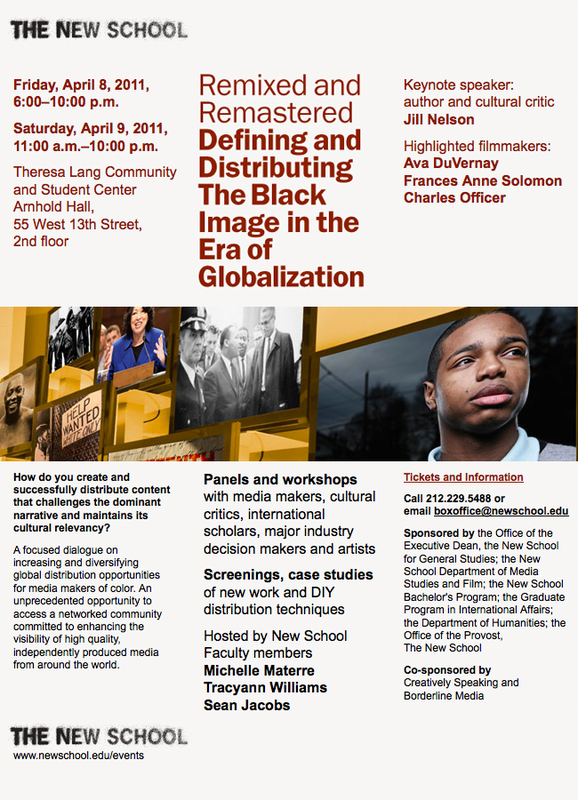 The conference is organized by New School professor and and media distribution consultant Michelle Materre. She affirms that "The need for this conference became apparent after witnessing the steady decline of outlets for filmmakers of color since the distribution company I helped to found 20 years ago, KJM3 Entertainment Group, released Daughters of the Dust. 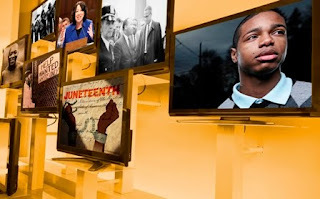 Twenty years later, negative images persist and the acceptance and assimilation of Black images into mainstream media has ironically reduced access to commercial outlets for content creators of color." It is free to all students from any college (with ID), as well as New School faculty and staff. The New School is a legendary progressive university comprising eight schools bound by a common, unusual intent: to prepare and inspire its 10,510 undergraduate and graduate students to bring actual, positive change to the world. From its Greenwich Village campus, The New School launches economists and actors, fashion designers and urban planners, dancers and anthropologists, orchestra conductors, filmmakers, political scientists, organizational experts, jazz musicians, scholars, psychologists, historians, journalists, and above all, world citizens-individuals whose ideas and innovations forge new paths of progress in the arts, design, humanities, public policy, and the social sciences. In addition to its 88 graduate and undergraduate degree-granting programs and majors, the university offers certificate programs and more than 650 continuing education courses to more than 6,350 adult learners every year. April R. Silver: Social entrepreneur, activist, and writer/editor. Child of God, daughter of Eddie and Jenny B., big sister to Omar and Lexus; lover of pecans and raisins, and all things Michael Jackson, The Jacksons, and The Jackson 5. Content Copyright by April R. Silver /. Awesome Inc. theme. Powered by Blogger.